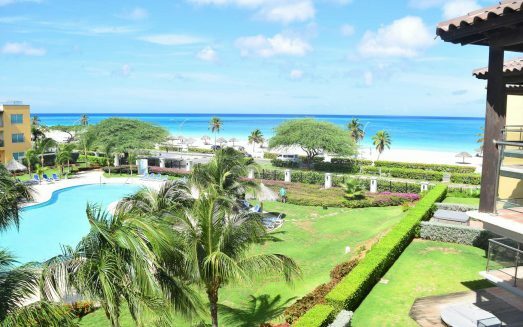 Featuring actually three master bedrooms and a forth lanai bedroom on the rooftop, the Ultimate Penthouse Three Plus-bedroom condo is unquestionably the ultimate of luxury beachfront vacation accommodation on the entire island of Aruba! 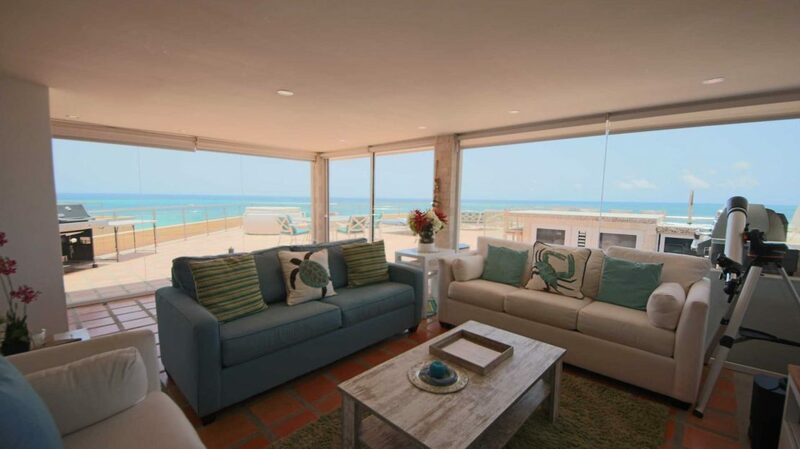 This beachfront condo has the most spectacular, breathtaking ocean views from the living/dining room areas as well as all balconies, has three master bedrooms and a large, private penthouse roof top terrace with glass-enclosed lanai, which also can be used as fourth sleeping quarters. With more than 3,000 square feet of interior living space, plus a private roof terrace including lanai of about the same size, this condo will provide you with great panoramic ocean views of the world-famous Eagle Beach with the maximum of luxury, comfort, space, leisure and relaxation.This amazing unit has downstairs three master bedrooms and three-and-a-half bathrooms! The very large ‘en suite’ Master Bedroom is bountifully provided with a king-size Sleep Number® bed, a large private balcony, a flatscreen HDTV, an exercise bike, abundant closet space, large his and hers ‘en suite’ bathroom vanities with another flatscreen HDTV, and a private full modern bathroom with a third sink, toilet, vanity, glass enclosed shower area and flatscreen HDTV!The second master bedroom has a queen-size Sleep Number® bed, a balcony which conveniently connects to the living room’s balcony, a flatscreen HDTV, abundant closet space and of course its own full modern bathroom too. The third master bedroom has a queen-size Sleep Number® bed, a flatscreen HDTV, abundant closet space and of course the third full modern bathroom. Furthermore, there are three twin-size Aero mattresses with extra pillows and linens to increase the sleeping capacity for your extra guests. 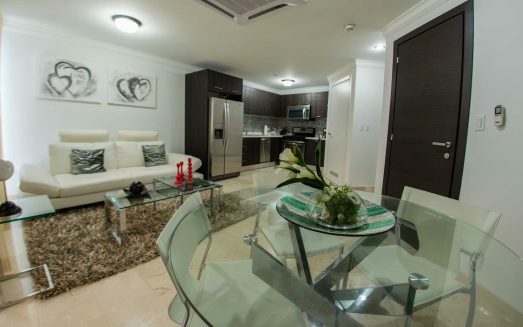 There are also 2 safes in the condo for you to use, as well as a pack ‘n play crib and portable high chair.There is a full-sized fully equipped modern kitchen with several extra kitchen appliances that are not commonly found in vacation accommodations. A 10-seat dining table is included for your indoor family or group dining events. There is a lavish and spacious living room with a large, comfortable sofa with 2 reclining seats on each end plus 2 individual comfortable reclining chairs, a 50-inch big-screen HDTV, a desk with an IP-phone and even wired internet connection; the floor-to-ceiling glass windows and doors in this area ensures you great ocean views at all times from all angles! The washer and dryer can be found in the guest’s bathroom off of the kitchen. 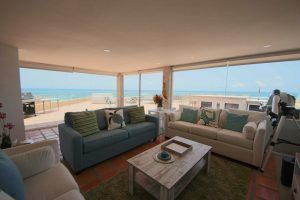 Further, accessed through an internal spiral staircase, there is a 400 square feet glass-enclosed lanai with two sofas, a very comfortable queen-size sofa-bed, 62″ big-screen HDTV and full bathroom. From this area considered as a fourth bedroom too, stepping out of the lanai, there is a 2,100 square feet tiled roof terrace stretching over the entire condo, with extra-luxurious terrace furniture and lounging chairs, a very large and heavy duty umbrella, a full-size outdoor utility kitchen with built-in large WEBER gas BBQ-grill, fridge and ice maker, patio dining tables, a large outdoor hot tub and spectacular, panoramic ocean views! Kid’s toys & games, a well-stocked DVD library, a DVD player and an iPod-compatible stereo set are all available for your additional comfort and relaxation. This unit is located in the Boca Grandi building on the fifth floor, with no floors (other than its own roof terrace) above it.—Sleeps max 10. The common facilities include three large swimming pools, a kiddy pool, a gym, a sauna, a business center, two tennis courts and a kids playroom. Wonderful landscaping on the premises. 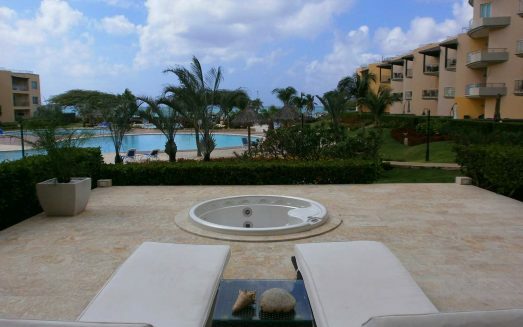 Enjoy the tranquility of the resort and stroll on the beautiful and world renown Eagle Beach just steps in front of the premises!